At Health Magnetic Store & More we take pride in choosing the best quality magnetic and non-magnetic health products for your complete health and balance. We distinguish ourselves in verifying all magnet's polarity and potency. Our objective is to bring you a wide variety of products in one same place. For over 40 years the products that Health Magnetic Store & More offer are researched and analyzed by the owners, a family of 3 generation Chiropractors, pioneers in Biomagnetic science in the island of Puerto Rico, since the 1970's. Excellent results are reported by the thousands of clients and patients experiencing the correct Magnetic therapy and products, since the late 1960's by the late Dr. Ralph U. Sierra, Dr. Irma I.Sierra, Dr, Jorge C. Jarrot, Dr. Jorge R. Jarrot Sierra, Dr. Alexandra C. Jarrot Sierra and Dr. Adrian J. Jarrot Sierra. We now stand on the verge of a great new age in magnetic science and its applications, a tool that has been provided by Mother Nature itself. It all started back in 1967. Dr. Ralph U. Sierra was 63 years old. He was struggling with two health situations: Merniere’s disease and an enlarged prostrate. Dr. Ralph Sierra was the first Chiropractic doctor in Puerto Rico. He is considered the Father of Chiropractic and Biomagnetism in Puerto Rico. In 1967, he began his research with Albert Roy Davis, Florida, that aided Sierra with his condition and cured him with the application of a dominoe magnet to his ear and drinking magnetic north water with sodium bicarbonate. He started doing research with magnets with him, my mother, aunts and of course, his daughter, me Dr. Irma Sierra. As the pioneer of Bio-Magnetism, he became an international speaker on this Science, travelled to many US States, Canada, South America, Mexico, Dominican Republic, and even Egypt. He incorporated Puerto Rico Scientific Research Laboratory where many scientist, researchers and Medical doctors from all over the world, US, Canada, Australia, France, Japan, China, visited him to exchange studies, research and knowledge. This happened during the decade of 1970's. They all agreed magnetic energy causes physiological effects in the living systems. The lab was in a private section of our residence, as was his Chiropractic practice. In the morning he attended patients and in the rest of his time he was in the Lab. Hundreds of interviews on television programs, such as, "De Todo un Poco" with Ramiro Martinez, Elena Montalvan, Telemundo, also radio, and many United States newspapers. His research is published in 2 books, The Body Electric and in Dr Buryl Payne Magnet book. He also contributed his research to Roy Davis that was puvlished in his book Anatomy of Biomagnetism. Later his name as a Co-author was eliminated and I remember how he felt when he received the book and read his name was changed for someone else. That ended the relationship he had with one of the authors, his participation of the book he aided and was not given the credit he well deserved! Dr. Sierra designed magnetic bands that he personally prepared for his patients, and these became famous with professional sports players, “The Magic Bands of Dr. Sierra”, as they wore them in the fields for their injured joints. Let me tell you, the magnetic supports that you see manufactured today were because he, Dr. Ralph Sierra, had the courage to come out to the world and say, north magnetic energy works! After school, I spend endless hours with him; learning and helping him prepare the flexible magnetic back and neckbands. I even prepared the shipping for the orders received from the lectures and articles he was exposed. Dr. Sierra, Ralph, passed away late 1982 after a fall he received trying to apply a postively charged magnetized nail into the trunk of a mango tree because it was not producing mangoes. Later that tree always produced mangoes, and sweet! Along with Dr. Battacharya, he wrote Power in a Magnet, and it was a hit! Later he wrote Energía Magnética. Then in 1984, I received my Chiropractic Physician and started my practice with all his equipment. My mother, Irma also his aid, and by then mine, helped me with applying the Electro-Magnetic therapy to the patients, as we both kept preparing the magnets for sale. 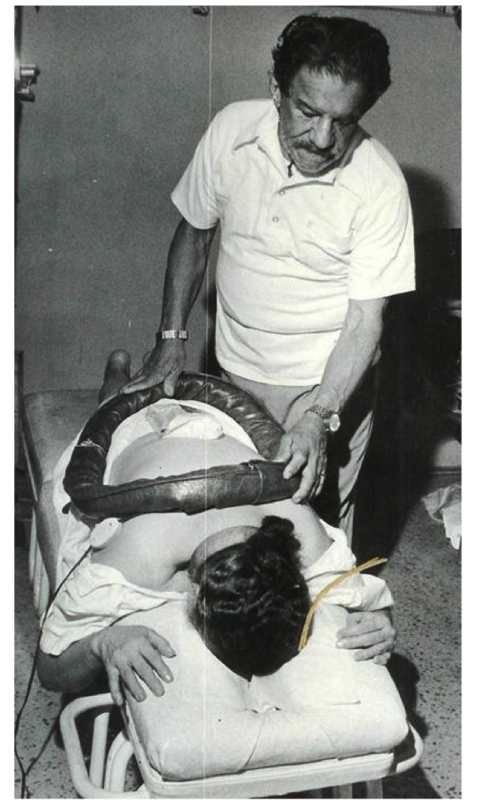 Yes you read correctly, Electro-Magnetic therapy, he hand made a pEMF back in the 1970's!!! Ahead of his time! All the images are in his original book, Power in a Magnet that you can purchase online. The new revised Power in a Magnet is 2 books in 1. His book is in the back pages. Soon after, I married Jorge C Jarrot, my right hand, with an Applied Electronics degree and always interested in Dr. Sierra's research. When he was in High School, Sierra helped him with a Science Fair experiment on magnetic and pyramid energies. Later he became a Chiropractor too. Now, 2018, our 3 children, all grown up are also Chiropractors as well, 3rd generation! They are following his grandfather and parents legacy, and quite well! The Jarrot Sierra’s! As you know, manufacturing of magnetic products became very popular in the 1980’s. Taiwan, China, Japan, Canada, Australia, Europe and United States manufactured magnetic products, most of which are with Dr. Sierra’s specification, north (-) to the skin. I say most because we are always buying and researching these products found in the web, that look like ours, we found that most of the magnetic products made, that are easily available to the general public, are missing the therapeutic potential needed to make a change. One or more magnets can have no strength, can be with the wrong polarity, or are so weak that at an inch there is no magnetic energy or force. We, always, carefully evaluate the magnetic strength, polarity and designs, THE INVISIBLE MAGNETIC FORCE that can travel and penetrate the physical body. Be aware of the imitations, replicas or the look alike and be certain you purchase from a qualified and credible source. That is the purpose to orientate you about us, and why Health Magnetic Store was established and to remind some and teach the new generation who Dr. Ralph. U. Sierra is. Health Magnetic Store, Inc is a company dedicated to the research of Biomagnetism, specializing in products that effectively work to relieve discomfort, promote healing and well being plus balance your energy system. Although we are experts in the field of Biomagnetism we do not pretend to cure and have all the answers. We make a great effort in searching and analyzing magnetic products that will provide wellness and without secondary effects. If you visit Puerto Rico or live in Puerto Rico, we invite you to visit our physical store located in San Juan, at 1053 Jesus T Pinero Ave, Exit 5A, Las Américas Expressway. In our website, we have divided the Biomagnetic products by area: like magnetic back supports, magnetic wrist supports or magnetic knee and magnetic ankle wraps. Choose from our variety of Biomagnetic products like the Blue Tsubo magnetic massager or Magnetic Hair Brush. Feel energy when you wear Magnetic insoles or Bio-Magnetic jewelry. All are North (negative) magnets facing the skin, except when specified as Multi, like the Multi insoles. The natural herbal supplements category includes the Dr. Sierra's Naturals and our patients favorite topical analgesic, Pain Less Cream + Cannabis oil, plus all the nutritional supplements to aid and support nutritionally every area of your body. Browse thru these pages and as you will see, we have more than excellent magnetic products for your health and wellness, we are and & more because in our store you will get the best of the supplements, back braces and orthopedic pillows! Reported effects vary from person to person. HMS is not responsible for the way you use them. Magnetic products are not intended to substitute your medical treatment. We try to ask that you please consult your health care provider before using magnets, however not all physicians agree with this alternative medicine. The information expressed in this site is based on Biomagnetic research and is still waiting for FDA approval.